Service “Image Cropper” was designed to crop images quickly and easily in rectangular or round format. The input image or several images are given to the service in .jpg or .png format after processing the output user can download an input image as a rectangle of the size 800×533 and circle of 100 pixels diameter in .png format. Framing – a selection of borders, and the size of the image. Usually, it is used to produce a more balanced picture. The service was developed primarily to facilitate filling with photos the KrokApp mobile application. 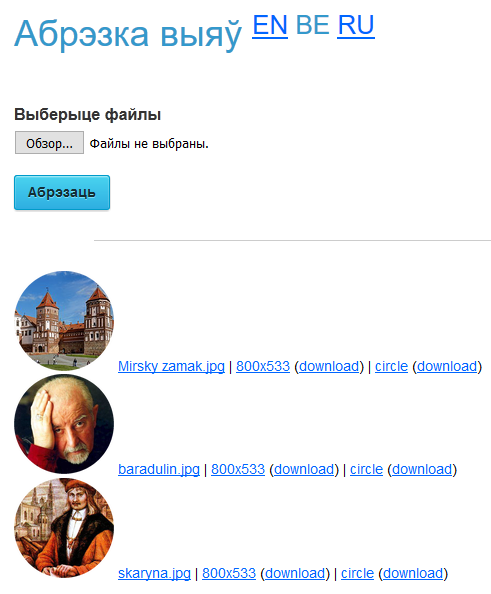 It is the audio guide for the cities of Belarus . The service allows cutting images in the format that is necessary for filling the content database of KrokApp without the difficult graphics editors, only in three clicks. In particular, the image of the sights in the program should have a size of 800×533, and its photo on preview page should be a circle with a diameter of 100 pixels in .png format. In case of further development and improvements in the service can be added the field of choice and size for a circular and rectangular cut that make the service more interesting to a wider range of users. circle 100 pixels diameter in .png format. The graphics service interface is shown in Figure 1. “Convert” button, which starts the process and allows you to get the results. In the dialog box select one or more files of images for cut, click “Open”. Click “Convert” button for image processing (Figure 2). Click on the link “800×533” and “circle” to view the final files. Click on the link “download” to download the final file. Output image files are downloaded with the same name that was at the input.